Hermes Tie - A Threat or a Possibility? To start with, I'm not really a fan of Hermes as a brand nor have I ever really wanted any of their new products. However, as with many older brands with undeniable heritage, their older items definitely have a certain appeal to them. This is very much the case with Hermes' ties which actually have a fairly large collector's market as well. Even that in mind, are these ties really something you can wear normally in today's professional or leisure outfits? I would say the answer is a solid yes, if your general style and other outfits pieces play along. I only recently purchased a couple of Hermes ties from a vintage store in Florence, but I've grown to like them quite a lot as part of my work attires. 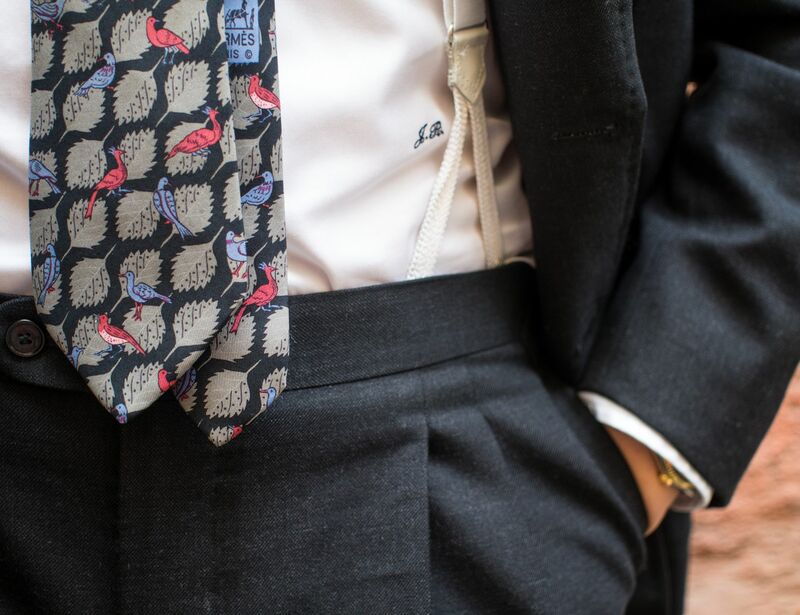 The other, one with a bird print that I'm using in this post's pictures, is a great option for my handmade charcoal grey wool suit I wear pretty much every week, but it's also great with a variety of other type of looks. 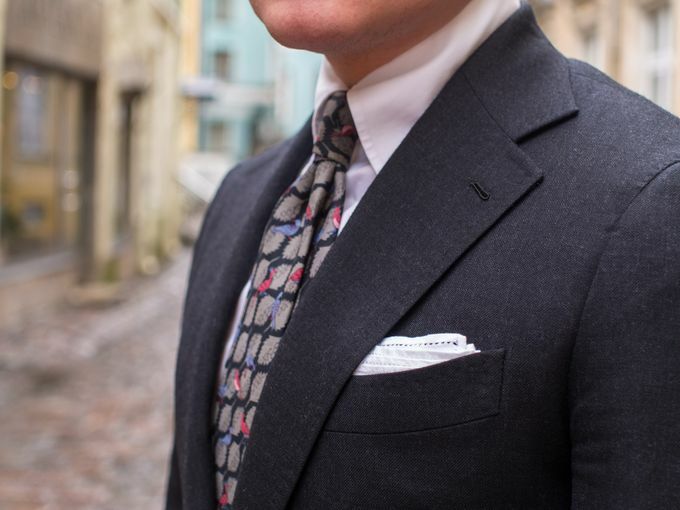 I feel that it's also a great example of how you can implement a tie with a very classic and vintage feel into a regular professional outfit. The formula is simple, if you feel your tie is a bit "loud" or just eye-catching, tone down the other elements of your look as I've done here. Most printed Hermes ties as well as vintage ties in general, can be a little bit flamboyant in their colors and prints. 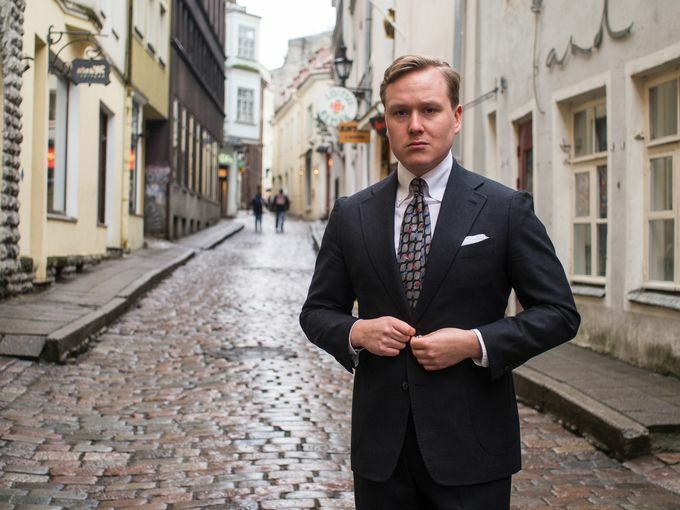 These type of ties will not generally pair well with an average SuitSupply suit that tend to have a very slim and overall more fashion-forward feel. 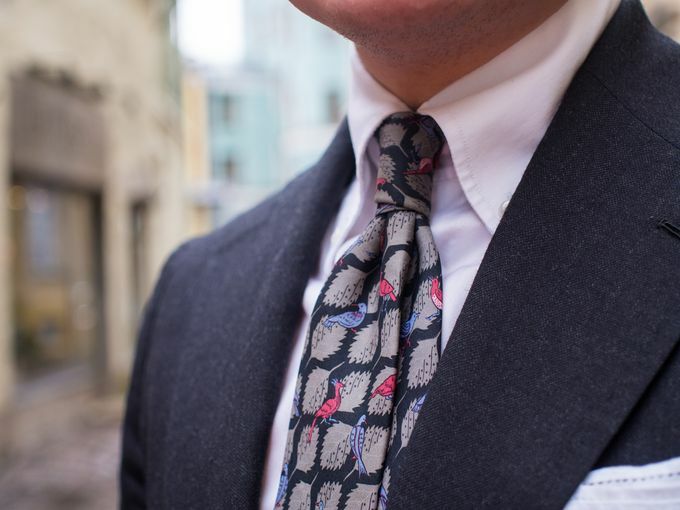 On the other hand, an old-looking tie with a neat print can be a surprisingly cool choice to a more classic look. 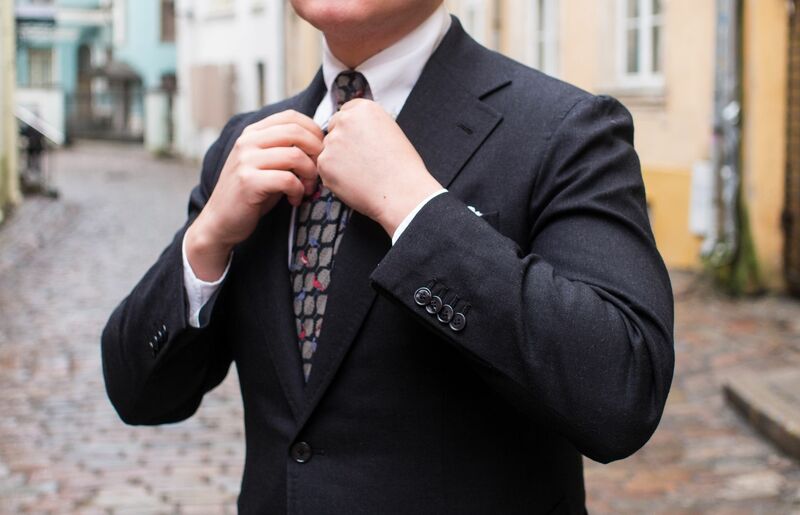 In general the basics of combining your menswear accessories applies the same way with vintage ties, but you may want to pay some extra attention to not selecting your suit and/or sport coat. In this particular outfit, I've played it quite safe. The charcoal suit has a great seasonal feel to it and in my opinion works great on both professional and more casual occasions. The versatile is greatly helped by the classic proportions, the soft Neapolitan shoulder and the patch pockets. 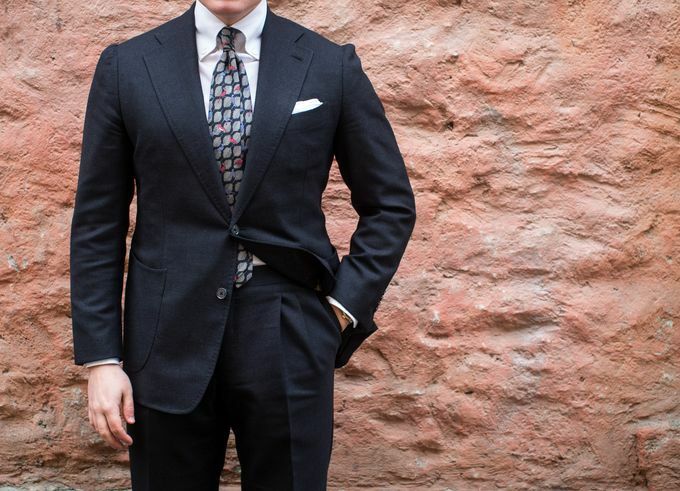 The heavy wool twill fabric from Dugdale Bros looks great and is very comfortable to wear both inside and outside, as it breathes rather well but also keeps the wind off. The accessories I've chosen include the Hermes tie in its charcoal and grey (with red and blue birds of course) color palette as well as my bespoke embroidered pocket square from House of Kydos. These pieces combined with a classic long collar point button-down shirt in crisp white are in perfect harmony, radiating that elegant handmade feel with a touch of the old and timeless style. As my entire look plays with different shades of grey, brown and even oxblood shoes are out of question. 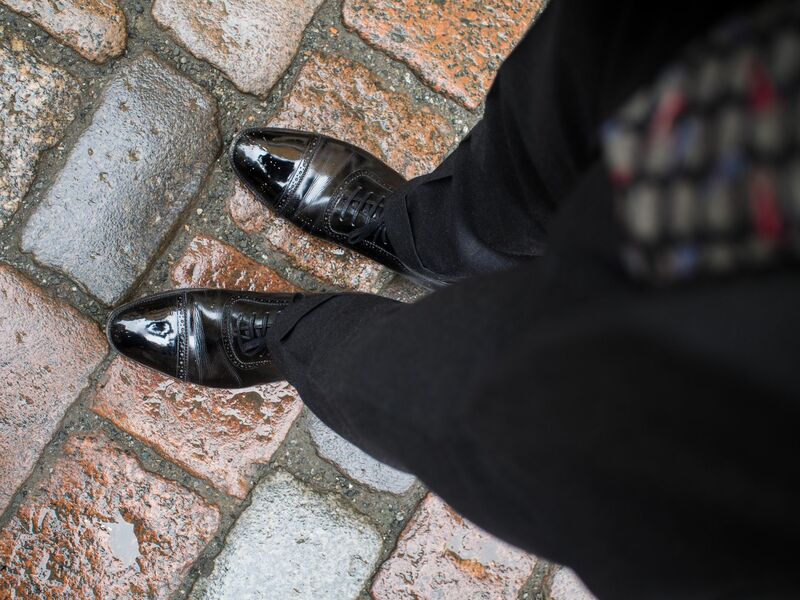 What I've decided to wear here are my handwelted Meermin Linea Maestro Adelaide Oxfords in black Freudenberg calf. While these shoes are perhaps bordering on being almost too formal for a semi casual look like this, I feel they work very well here. 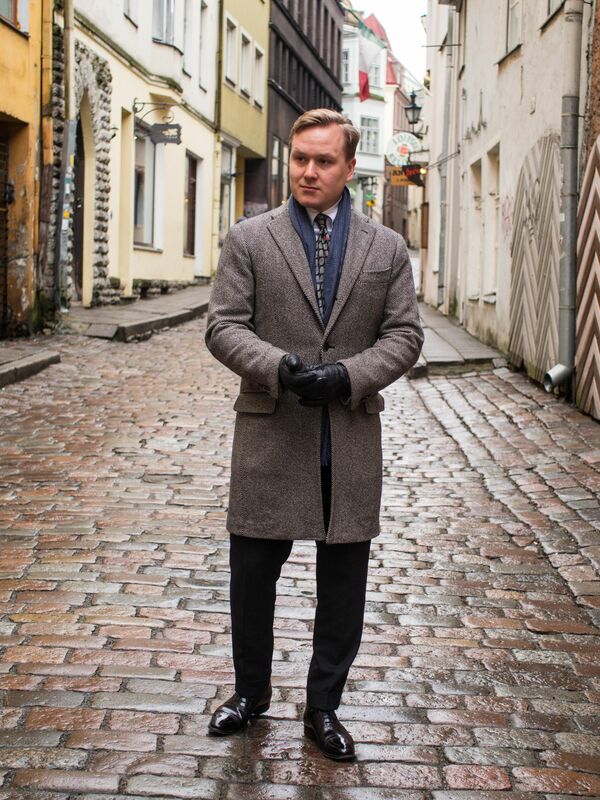 Other possible options for this type of outfit would include models such as black semi brogues, black austerity brogues or perhaps black penny loafers if the weather and the environment allow it. So, if you're feeling the vintage vibe and want to find your own bird tie, where should you look for one? The best place is most likely eBay, but I would also try different vintage stores when traveling in the bigger cities around the world. Cities such as New York, San Francisco, London and Milan are bound to have a ton of stores selling some old gems that are only waiting to be found. You may also want to check your grandad's and father's old ties, there can be some unexpected discoveries to be made there as well. Also when you find yours, make sure you're overall look is in line with your tie and you'll do great.